The first games are in the book and all went as predicted. The Miami Heat lost after a failing to get past the “curse of the ring night” and Derrick Rose’s comeback was spectacular, the LA Clippers cemented their status as legitimate contenders whilst seeing off their long-since-past-it city rivals and the Indiana Pacers had a comfortable win over the Orlando Magic. Well, as a famous singer almost once said, one out of three aint bad. The Heat, while indeed starting a little slowly (after Mario Chalmers reminded Derrick Rose that you need to protect the basketball, picking his pocket and feeding Udonis Haslem for the slam) they quickly picked up and ended the half 21 points to the good. They managed to hold off a Bulls comeback in the fourth, led by the impressive-but-can-he-do-it-when-it-really-counts Carlos Boozer who had 31 and were fairly comfortable in their 12 point win. Miami were led by LeBron’s 17 points, but only Udonis Haslem and Chris Andersen, of the players who played, failed to score double digits. Particularly impressive was Shane Battier who went 4-4 from the arc. The Bulls problems were evident throughout – they lack consistent wing scoring. Rose was actually pretty good in his first game in well over a year and his turnovers – five in this game – will drop as he finds his rhythm. Jimmy Butler and Luol Deng both got in foul trouble early, which meant that LeBron’s two major opponents had to sit for long spells of the first half. Tony Snell is not quite up to the job, at least not yet. I like the look of the Bulls, but they will go as Deng and Butler go. If these two can offer scoring from the wings, then they could well go all the way. The problem is that that is not particularly likely, as much as it pains me to say given how much I love Deng. The first game of the night, albeit the one that had its thunder stolen by events in South Florida, was in Indiana as the much vaunted Pacers took on the Magic. They started strongly, but Andrew Nicholson – so polite when TCC met him at the All Star Game earlier this year, even though we clearly had no idea who he was – kept Orlando in the game with a total of 18 points. Indiana came out strong in the third quarter and eventually put the Magic away, but will be worried by the sight of Roy Hibbert’s knee seeming to buckle in the fourth quarter. Hibbert later tweeted that he was ok and ready to play again today. His 7 – yes SEVEN – blocked shots in the game prior to his injury showed exactly what he will bring to the table this season. For Orlando, Victor Oladipo was solid in his NBA debut, but there wasn’t a whole lot else to write home about other than Nicholson. He will surely unseat Jason Maxiell as the starting power forward for this team going forward. The major objective for Orlando this season will be the development of Oladipo: can he be an NBA caliber point guard? He doesn’t look tall enough to get away with significant minutes at the 2 in the NBA and the Magic already have Arron Afflalo in that position. Chris Kaman – 10 points. Jordan Hill – 12 points. Jordan Farmar – 16 points. Jodie Meeks – 13 points. XAVIER HENRY (remember him?) – 22 freaking points. Unreal. The Clippers played fine, getting double-doubles from DeAndre Jordan and Chris Paul, but again their deficiencies, hangovers from last season, were all too obvious. Jordan is incredibly athletic but incredibly limited. If it’s not a dunk or a block, you can’t really rely on him for anything. The Lakers guards, particularly the savvier ones, went straight at him on pick and rolls. He ended up with five fouls. 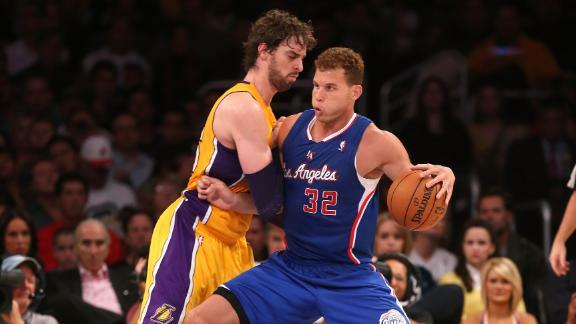 Griffin, for all that he is another fan favourite and a spectacular player, is also limited. He doesn’t offer enough defensively to be an elite player. Of course, it’s only one game. Eighty-one to go!